At the beginning of the school year (during a moment of weakness), I voluntarily agreed to be the room mom for my son's class. One of the responsibilities of being a room mom is organizing classroom parties. 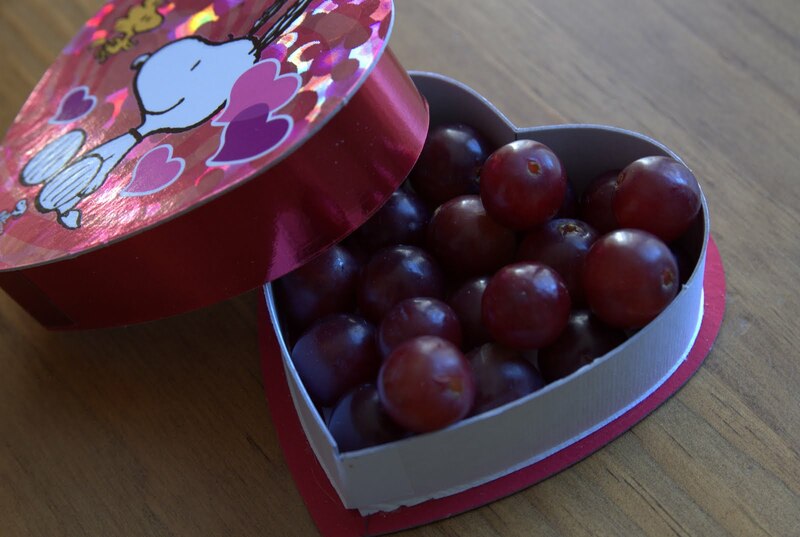 My son's teacher recently approached me with a request for the upcoming Valentine's Day party - please provide fruit, lots of fruit. So here are some hopefully cool ways to serve fruit to a bunch of first graders on Valentine's Day. 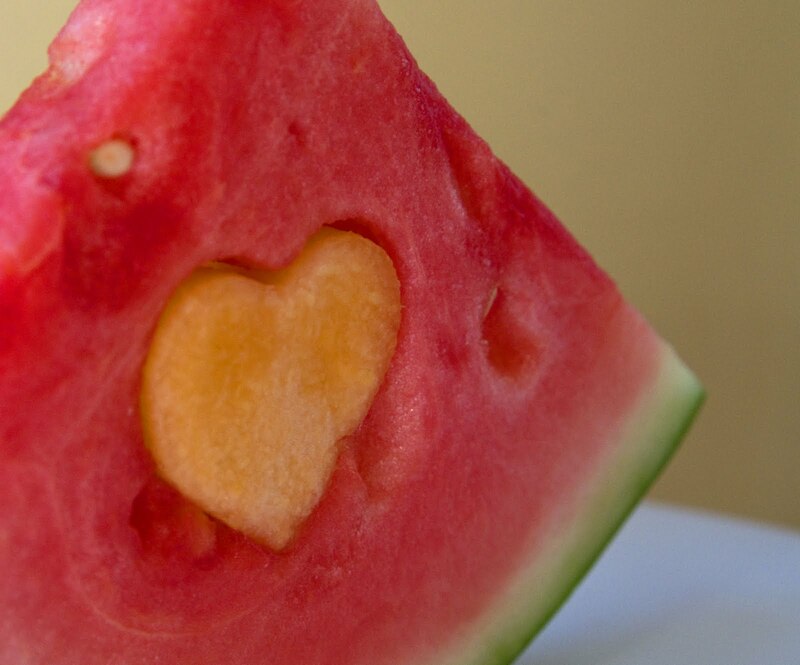 You can also cut out a heart in a different type of fruit (in this case cantaloupe) and place it inside the watermelon cutout. My little guy thought this looked, and I quote, "awesome"! Idea #3: What child doesn't like things that come on a stick? 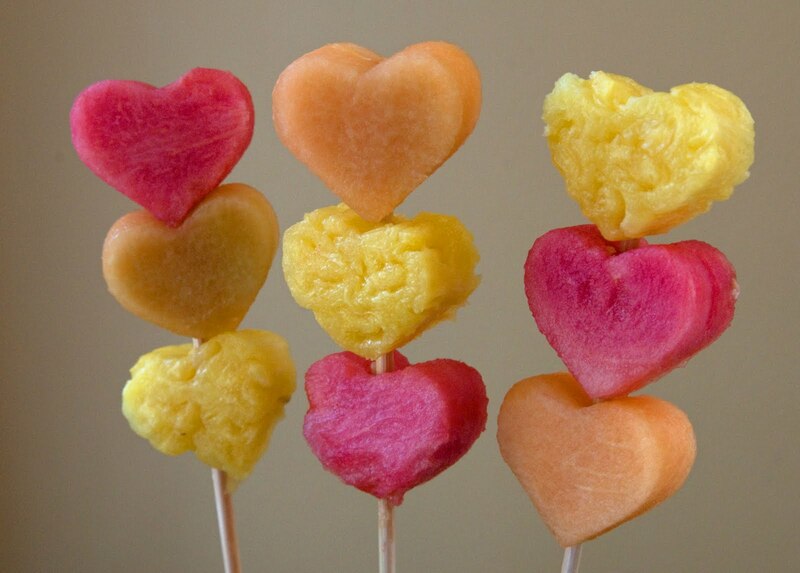 Again using the heart-shaped cutter, you can make fruit kebabs. 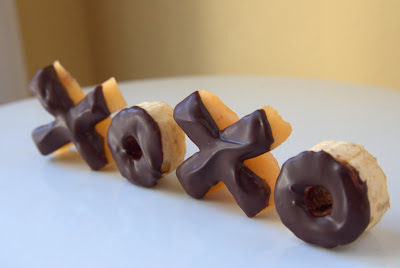 Idea #4: My husband thinks this is cheating because it involves chocolate, but I still think it's a good idea. First cut out 'x' and 'o' shapes in different types of fruit (I used cantaloupe and bananas) and then lightly dip them in melted chocolate - yum! Good luck to all the other room moms out there - hope this helps! I love this! Totally agree with the "anything on a stick" bit! 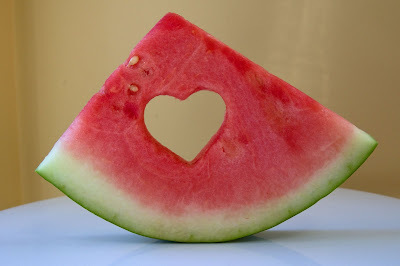 I am gathering some ideas together for my son's little Valentine's party and I will definitely be using this! I'll be linking to you - thanks! Love it! These ideas are fantastic! I Love all these Images & Ideas - My grandaughter is really into "bobbers" right now, I think we will make Idea #4 for Sunday dinner this week - Thanks for sharing ! Those are all adorable! I love the watermelon slice and the chocolate dipped fruit sounds so yummy! Wow! I am LOVING all these ideas! SO cute and creative!! Oh, I love this! Pinned the fruit kabobs and shared on facebook! I would love if you would submit the kabobs and I could feature them on my website! Thanks for the cute ideas! I'm doing my son's preschool snack this week. Thanks for shring your ideas. They are fun easy and i know everybody will love them I am going to share them at work. I really love this idea! It's so hot in Australia now, may I please share my version of your idea and link back to you? Thank you in anticipation. My name is Elena and I am curating a collection of Valentine’s Day recipe ideas for Looksibite(dot)com. I don’t know if you’re familiar with Looksi but it’s a lot like FoodGawker: they display a thumbnail image from your blog along with a short description and a link back to your original project. Typically you would submit your own images (like you do on FoodGawker) but they also have curators (such as myself) who do theme based round ups. I think your watermelon cut-outs would be perfect for my collection which will be published this Friday. Please let me know if you *don’t* want it included so I can remove it.